Soft drinks giants PepsiCo and Coca-Cola Hellenic have announced that they are to halt production at key plants in Russia in connection with the ongoing financial crisis. PepsiCo, the biggest soft drinks producer in Russia, said on March 2 it would close a fruit juice plant in the town of Ramenskoye (Moscow Region) which employs 400 staff and has more than 10 production lines. "From June 2015, juice production will be centred at the Lebedyansky plant (in the Lipetsk Region, southeast of Moscow) – one of the largest juice-producing plants in Europe," PepsiCo said in a statement. PepsiCo believe that this decision will allow the company to increase business efficiency and make the Lebedyansky plant a key center for juice production in Russia. The company promises to provide comprehensive support in full compliance with Russian labor law to all employees affected by this decision. Meanwhile, Coca-Cola Hellenic, the Coca-Cola bottler, has already closed its plant in Nizhny Novgorod, Yevgeniya Mogilyova, communications manager, told the TASS news agency on March 2. "We halted the production of two lines today and are now transferring production from Nizhny Novgorod to five other sites," she said [Coca-Cola Hellenic owns 12 plants in Russia – RBTH]. The company had earlier halted juice production at its Moscow and Novosibirsk plants in June 2014. Indra Nooyi, Chairperson & CEO of PepsiCo, told investors during a conference call on Feb. 11 that the company intends to restructure its Russian business and “to tighten their belts.” But company representatives did not specify how exactly this will happen. According to the Vedomosti business daily, PepsiCo prefers the Lebedyansky plant by virtue of its more modern infrastructure. 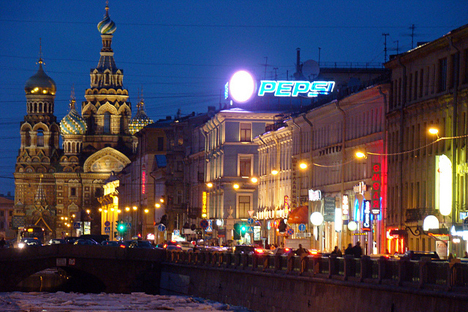 In 2014, PepsiCo has seen losses in the Russian market for the first time amid the devaluation of the ruble. The company's net income in Russia in 2014 fell by 10 percent, while the value of its long-term assets in Russia decreased by 43 percent, reflecting the fall of Russian ruble, the company noted. According to Euromonitor, PepsiCo had a 40 percent share of the Russian juice market last year, followed by Coca-Cola with a 24.1 percent share. The sales growth of Coca-Cola products in Russia slowed from 5 (2013) to 1 percent by the end of 2014. The juice market fell in Russia 2.5 percent in 2014 after a 1.5 percent decline in 2013 and an increase of 3.7 percent in 2012, according to Euromonitor. Russian partners refuse to pay franchise royalties over high purchase costs. Over the past quarter of a century, Russian cuisine has been enriched by new dishes that have arrived from abroad.